Google Apps Email is already explained earlier and now you can add Google Wave on Google Apps as well. Google Wave is a real time communication product from Google which came a year ago. If you are having Google Apps Standard or Premier account, you can add “Google Wave” on your Dashboard and use the same in your organization as well. How To Add Google Wave on Apps Dashboard? Google Wave is recently become a part of Apps World of Google. 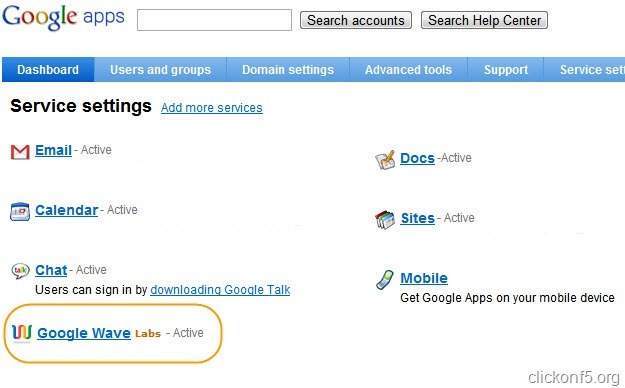 To add Google Wave on Google Apps, you should already have Google Apps account. 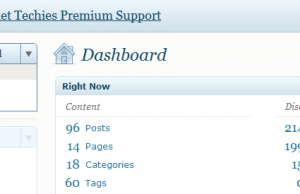 Then login to your dashboard i.e. google.com/a/yourdomain and click on “Add more services” link beside the “Service Settings”. There you can see new releases available to become a part of your Apps account. There you can see “Google Wave” labs. 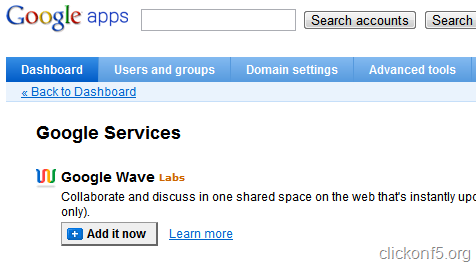 Click on “Add it now” button below the Google Wave Icon. Now you and your organization, group can use Google Wave thru Apps service. This is really helpful for small businesses and people working thru online collaboration. ← Previous Story Why and How To Host Custom Domain Emails on Google Apps for Free?